The Culgoa River is a river that is part of the Darling catchment within the Murray–Darling basin and is located in South West Queensland. The river is a continuation of the western branch of the Balonne River in southern Queensland, near Dirranbandi, and flows generally south-west across parts of the Darling Riverine Plains, joined by ten tributaries, including the Balonne and Birrie rivers, before forming its confluence with the Darling River near Bourke; descending 78 metres (256 ft) over its 489-kilometre (304 mi) course. Cubbie Station, located on the Culgoa River, is situated adjacent to a large diversion channel which permits the farm, under licence to store 460,000 megalitres (16,000×10^6 cu ft) of river water. According to downstream farmers in 2008, large cotton farms, such as Cubbie Station, have reduced the traditional flow of the Culgoa River by one third. By 2009, downstream farmers where claiming that due to upstream water entitlements on the Culgoa River, since 2000, the Lower Balonne floodplain had not received enough water to flood the plains. Prior to the granting of these rights, the Lower Balonne River flooded every two or three years; impacting the sustainability of flora, fauna, birdlife, and economic returns from grazing livestock and cropping. Little Culgoa Creek, an anabranch of the Culgoa River, leaves the river near Goodooga and returns to the river near Brenda Gate. The river flows through the Culgoa Floodplain National Park and the Culgoa National Park, located respectively north and south of the border between Queensland and New South Wales, west of Goodooga. Culgoa is an Aboriginal word meaning "running through" or "returning". ^ a b "Indigenous place names" (PDF). Ipswich City Council. Archived from the original (PDF) on 24 January 2013. Retrieved 27 January 2013. ^ "Map of Culgoa River". Bonzle Digital Atlas of Australia. Retrieved 27 January 2013. ^ "Culgoa River". Geographical Names Register (GNR) of NSW. Geographical Names Board of New South Wales. Retrieved 27 January 2013. ^ Ker, Peter (18 August 2009). "Water resource hope on sale of Cubbie Station". The Age. Retrieved 7 December 2009. ^ Long, Stephen (18 September 2012). "Cubbie Station: a dozen rival expressions of interest ignored" (transcript). PM. Australia: ABC News. Retrieved 27 January 2013. ^ Roberts, Greg (24 January 2008). "Farmers in fight over floodwaters". The Australian. Retrieved 7 December 2009. ^ Elks, Sarah (19 August 2009). "Water grab preventing floods and taking toll on trees". The Australian. Retrieved 7 December 2009. ^ "Little Culgoa Creek". Geographical Names Register (GNR) of NSW. Geographical Names Board of New South Wales. Retrieved 27 January 2013. 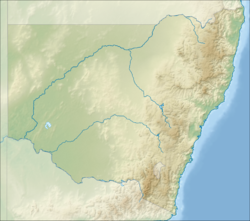 "Lower Balonne River Floodplain System". Guide to the proposed Basin Plan: Technical background: Part II: Appendix B: Hydrologic indicator sites (PDF). Murray–Darling Basin Authority. pp. 499–520.